�This day is good, it is the day of purification.� This is a time when we can set aside the heavy days of sin, break the chains of iniquity: �to raise the tabernacle that is fallen, and close up the breaches thereof� within our souls, and see it renewed and bright. But the path to this blessed purification is not easy. We have not yet approached confession, and our soul already hears voices of temptation: �Should I wait instead? Am I well-enough prepared, don�t I partake of Communion too often?� We must firmly reject such doubts. �If you aspire to serve the Lord, prepare yourself for an ordeal� (Ecclesiasticus/Sirach 2:1). If you have decided to make confession and partake of Communion, many obstacles will arise, internal and external: but they will vanish as soon as you express firmness in your intention. 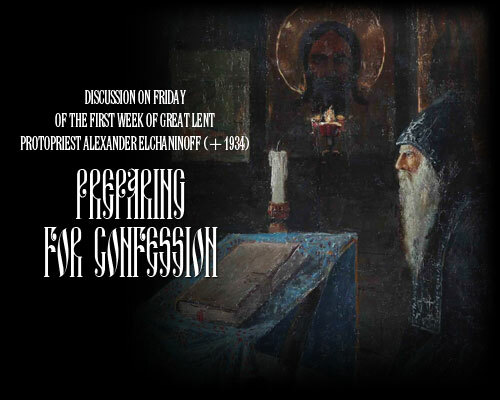 In particular, the question of making confession too frequently: One must make confession much more often than is customary; at least once during each of the Lenten periods. We who are possessed by �dreams of sloth� and clumsy in our repentance, must time and time again learn to repent. Secondly: it is necessary to draw a thread from one confession to the next, so that the period in between is filled with a spiritual struggle, with efforts fed by the impressions of our last Communion and inspired by the expectation of our next confession. For a person who truly suffers the pain of his sin does not care whom he confesses it through; he just wants to confess it as soon as possible and receive relief. Another problem is when we set aside the essence of the Mystery of repentance and go to confession for a simple chat. It is important to discern between confession and a spiritual discussion, which can take place outside of the Mystery, and it is better to take place separately, since a discussion, even on a spiritual matter, can distract a person, dishearten him from repentance, lead to a theological debate, to weaken the desire of the penitent to confess. Confession is not an admission of your faults, your doubts, but is the revealing of yourself to your father-confessor, and not simply a �pious custom.� Confession is the fervent repentance of the heart, the expression of thirst for cleansing, stemming from the sense of sanctity, of dying to sin and coming alive in holiness. Full repentance is already a level of holiness, while disinterest, disbelief, is outside of holiness, alienated from God. Let us make sense of what our attitude should be towards the Mystery of repentance, what is required of the one making confession, how one should prepare, what the most important moment is (the part of the Mystery which touches the penitent). Of course, the first act must be to test the heart. The preceding days of preparation are customary. �To see ones sins in their multitude and all their foulness is truly a gift from God,� said Fr John of Kronstadt. Usually, people inexperienced in the spiritual life do not see the multitude of their sins, nor their foulness. �Nothing unusual,� �Like everybody else,� �Just little sins,� �I didn�t steal or kill,� is how many people begin their confession. Meanwhile, self-love, rejection of criticism, hardness of heart, flattery, weakness in faith and love, cowardice, spiritual sloth�are these not all important sins? Can we honestly declare that we love God enough, that our faith is vigorous and fervent? That we love every person as a brother in Christ? That we have achieved meekness, tenderness, humility? If not, then wherein lies our Christianity? How are we to explain our self-confidence during confession, how are we to avoid hard insensitivity if not through a dead heart, deadened soul, which foreshadow physical death? Why do the Holy Fathers, handing down prayers of repentance to us, deem themselves the chiefs among sinners, with earnest conviction crying out to Jesus the Most-Sweet: �None from the ages has sinned as have I, the condemned and wayward, sinned!� Yet we are convinced that everything is alright in our lives! But the brighter the light of Christ shines upon our hearts, the clearer all of our failings, our ulcerations and sores become. And conversely, people immersed in the darkness of sin see nothing inside their own hearts: and if they do, they have no fear, since they have nothing to compare it to. The straightforward path to knowing one�s own sin is approaching the light and prayer for this light, which is the condemnation and all that is temporal within ourselves (John 3:19). So far as there is no proximity to Christ, during which we are in a perpetual state of repentance, therefore we must test our conscience as we approach confession, according to the commandments, certain prayers (for instance, the 3rd evening prayer, the fourth prayer before Communion), specific passages in the Gospel (for instance, Romans 12, Ephesians 4, James, especially 3). In tending to our spiritual life, we must try to discern our fundamental sins from those that flow out of them, symptoms from their root causes. For instance, very important are inattentiveness during prayer, daydreaming and wandering thoughts during church services, a lack of interest in what is read from Holy Scripture; but do not these sins stem from lack of believe and a feeble love for God? We must notice within ourselves our self-will, our disobedience, self-justification, impatience with criticism, intransigence and stubbornness; but it is more important to reveal their connection with self-love and pride. If we notice within ourselves the urge for company, talkativeness, mockery, excessive care for our own appearance and that of others, how others dress and how they live, we must carefully consider if these are merely forms of conceit. If we too closely take earthly failures to heart, if we cannot bear the burden of separation, if we grieve too much for those who have departed from us, then doesn�t this reveal within us a lack of faith in Divine Providence? There is another method of helping to lead us to knowledge of our own sinfulness: we must remember what others often accuse us of, especially our neighbors, our loved ones: their accusations, their criticism and attacks almost always have some foundation. We must also ask forgiveness of all whom we have wronged before going to confession, so as to approach this Mystery with a clear conscience. While investigating our hearts in this way, we must take care not to fall into extreme suspicion and petty nitpicking for every movement of the heart; embarking upon this path, we could lose a sense of what is important and what is unimportant, we can become mired in trifles. In such cases one must temporarily set aside examining your soul, and, taking up a �spiritual� diet, simplify and clarify our souls with prayer and good deeds. Preparing for confession does not mean fully remembering and recording every sin, but to attain the state of concentration, seriousness and prayer, which will reveal our sins when exposed to light. There is no need to bring to your father-confessor a list of sins, but the devotion to repentance, not a detailed dissertation, but a humble heart. But to simply know one�s sins does not mean to repent of them. True, the Lord accepts confession�earnest, open-hearted confession�when it is not accompanied by a powerful feeling of repentance (if we courageously confess even this sin�that of being hard of heart). Yet a humble heart, sorrow for our sins, is the greatest thing we can bring to confession. But what are we to do if our hearts, �parched from the fires of sin,� is not sprinkled by the invigorating moisture of tears? What if an �unwilling spirit and weak flesh� are so powerful that we are unable to bring genuine repentance? This is still no reason to delay confession�God can touch our hearts even during confession itself: the act of confession, the listing of our sins alone can soften our hearts, sharpen our spiritual vision, heighten our sense of repentance. Most effective of all in overcoming our spiritual feebleness are preparation for confession, fasting�which weakens our body, disrupting our bodily well-being and placidity�prayer, nightly thoughts of death, the reading of the Gospel, the Lives of Saints, the works of the Holy Fathers, increased struggle against our desires, exercises in good deeds. Our numbness during confession is usually rooted in the lack of fear of God and our hidden disbelief. All of our efforts must be aimed in this direction. That is why tears are so important during confession. They soften our hard hearts, they shake us from head to toe, they simplify everything, they grant us a blessed abandonment of ourselves, they reject the main obstacle to repentance, our �ego.� The proud and self-loving never weep. Once you cry, it means you have softened, melted, humbled yourself. That is why after such tears we experience meekness, calm, softness, kindheartedness, spiritual peace, we are granted by the Lord to weep with joy. One should not be ashamed of tears during confession, one must allow them to flow freely, washing away our iniquities. �Grant me clouds of tears, o Christ, that I may weep and wash away the filth of my desire for sweet things and appear before you as one who is clean� (matins on the First Monday of Great Lent). The third element of confession is the verbal confession of sin. One must not wait for questions, one must make the effort; confession is a podvig and an act of forcing oneself. One must speak concisely, not obscuring the ugliness of sin with general expressions (for instance, �guilty of violating the 7th commandment�). It is very difficult while confessing to avoid the habit of self-justification, to attempt to explain to the father-confessor the �mitigating circumstances,� references to third parties who may have led us astray. Any such attempts are evidence of self-love, the lack of profound repentance, the continued contact with sin. Sometimes during confession, people blame a bad memory, which prevents them from remembering their sins. Indeed, at times it happens that we forget our fall into sin; but is this because of a poor memory? For events that hurt our self-love, or on the other hand, which flatter our vainglory, our successes, praises we earn we remember for many years. Everything that has a profound effect on us we remember clearly for a long time, yet if we forget our sins, doesn�t this mean that we don�t think them very important? A sign of true repentance is a lightness of heart, of purity, of unspeakable happiness, when sin seems to us as burdensome and impossible as this happiness seemed not long before. Our repentance will not be complete if, when we make confession, we do not resolve not to return to the same repented sins. But, one might ask, how is this possible? How can I promise to myself and to my father-confessor that I will not repeat this sin? For through experience, we all know that after some time, we will always return to the same sins; as we observe ourselves year after year, we see no improvement, �we jump up, and fall right back down.� It would be horrible if it were so. But fortunately that�s not the case. It doesn�t happen that when someone makes confession with a willing heart and partakes of the Holy Gifts, some good changes do not occur in the soul. But the problem is, first and foremost, that we are not our own judges; a man cannot properly judge himself, whether he has become better or not, since he would be both the judge and the one standing trial. A greater strictness towards oneself, a better view of ones soul, heightened fear of sin may give the illusion that one�s sins have increased and strengthened: they may even have weakened, but we had not noticed them as much before. Also, God, by His Divine Providence, often closes our eyes to our successes in order to protect us from worse sins�those of vainglory and pride. It often happens that the sin remains, but frequent confession and partaking of the Holy Gifts could shake and weaken their roots. The very battle with sin, suffering from one�s sins�is that not a victory? If there is no sense of relief, of rebirth, one must have the strength to return once again to confession, to rid oneself finally of the impurity, to wash its darkness and filth away with tears. Whoever strives for this will find what they seek.